INDIANAPOLIS – Retro uniforms are not uncommon in most pro sports and retro paint schemes abound in NASCAR. But, until now, that wasn’t the case in the IndyCar set. On Sunday, three-time Indianapolis 500 winner Helio Castroneves will start the race fourth in the 33-car field. And nobody should have any problem spotting his car on the inside of the second row. The No. 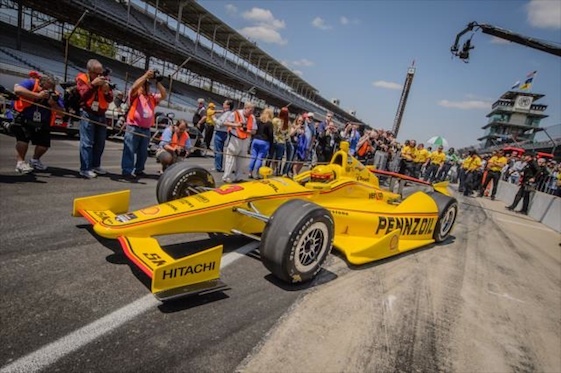 3 Penske Chevrolet is without doubt the brightest, most visible car in the field, it’s canary yellow Pennzoil paint scheme a throwback to the cars in which Johnny Rutherford won at Indy in 1980 and Rick Mears in 1984 and 1988. The famed Yellow Submarine is back. And Castroneves is even wearing a bright yellow helmet to match the car’s paint job. Castroneves will bid for a record-tying fourth Indy victory on Sunday. But, having not won since 2009, he’s getting a little tired of people asking if he can do it again, matching A.J. Foyt, Mears and Al Unser for the most IndyCar wins at the famed Brickyard. “I always feel like we can win here,’’ Castroneves said. “But things haven’t gone our way the last few years. Still, every year when we get here, we feel like we’re the team to beat. Castroneves said to win this race takes a combination of preparation and luck. But, to take advantage of the luck, you have to be in the right position at the right time. “To make this happen, you’ve got to work. You’ve got to execute,’’ he explained. “That’s what we’ve been doing the entire month. We want to make sure that we have a competitive car. A big thing that Castroneves has going for him now is team owner Roger Penske directing his race. Penske, whose team has won Indy an astounding 15 times since he first came here in 1969, took over the direction of Castroneves’ car late last year. “I’m more confident having Roger on my radio this time,’’ Castroneves said. “I feel this place is all about experience and nobody has more experience here. Pressed on the point, Castroneves admitted, “It would be awesome’’ to win the race for a fourth time, “because it’s only three guys that have done it before. And it would be especially meaningful for Mears if Castroneves does it this year.